Today I am thrilled to be able to share with you this interview with one of my heroes, Robin Sharma. 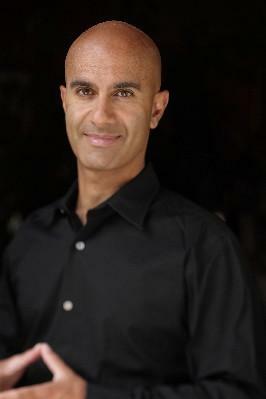 Robin Sharma is one of the world’s top experts on leadership and personal success. He is the author of 10 major international bestsellers, including The Greatness Guide and The Monk Who Sold His Ferrari . Robin is the CEO of Sharma Leadership International Inc., a global training firm whose clients include GE, Nike, FedEx, NASA, Unilever, Microsoft, BP, IBM, The Harvard Business School and Yale University. If you enjoy the interview, be sure to visit Robin at his website robinsharma.com. Pick The Brain: My first question relates to the life you were living prior to writing The Monk Who Sold His Ferrari (which is over 10 years ago now). I recall you saying that you were living your life from the outside-in rather than the inside-out. Can you explain what you meant by this? Robin Sharma: like Julian Mantle in The Monk Who Sold His Ferrari , I had many of the trappings of success. I was a lawyer. I drove a nice car and I had nice things. But “things” don’t make a rich life. Making money isn’t a bad thing at all – it allows for a lot more freedom. But as a lawyer, money way my driving force. As the years passed, I accumulated more but was less happy. It wasn’t until I began to work on my inner life and know myself that my life changed. Success really does begin within. The size and quality of your outer life is only limited by the size and quality of your inner life. And life is a mirror – giving us not what we want but who we are. It took me years to get that. PTB: Perhaps the single most important lesson I have learned from you is the value in waking early and, in particular, the idea of having a “Holy Hour”. May I ask you what you how you spend your Holy Hour each morning and the importance of this ritual in your life? Robin: The Holy Hour, as you know, is simply 60 minutes at the beginning of your day that you devote to self-mastery and personal development. If your outer life is really a reflection of the quality of your inner life, then it’s a brilliant move to spend at least an hour a day working on yourself. This simple idea alone has helped so many of our clients from around the world get to world-class in business and in life. During my Holy Hour, I journal, I read inspirational books, I review my goals and plans and I simply make the time to think. Because clarity precedes mastery and the more clear you can get on what you want to create in life, the more focused you will be in your daily behaviors. Every day can be a platform to get you closer to your mountaintop. And yet, too many people live life by accident. PTB: I know the most important thing in the world to you is your two kids, Colby and Bianca. I am a father myself, and I am interested to hear any suggestions you having for maintaining an optimal work-life balance. Robin: My two kids are my heroes. As I wrote in The Greatness Guide , “the things that get scheduled are the things that get done”. So I spend a lot of time in planning (saves me time during the day because I’m locked in to what’s most important rather than reactive). I plan my time with my kids. As well, I see myself as a developer of them. So I travel with them and expose them to great art and great minds. And I encourage them to be their best. With my kids, I know I only have a small window of opportunity before they get older – so I carve out time for them now. I’ve worked with too many CEOs who arrived at the mountaintop of success but got there alone. Family matters. PTB: One of my favourite quotes which you introduced me to is: “the price of discipline is always less than the pain of regret”. I have used this quote a number of times in my articles, and it always gets a response. Do you have any specific advice for people who struggle with discipline? I know you love to read whenever you get the chance. What was the last good book you read and why would you recommend it? I re-read The Message of a Master – great book. I also read Outsmart by Jim Champy – a good new business book. PTB: Robin, through my blog I come across a lot of people who want to change but don’t know where to start. What do you suggest people in this situation do? In particular, is there anything they can do today that can help put them on a new course? The smallest of actions is always better than the noblest of intentions. High performers have a bias towards action. There’s great power in just starting. Taking a single step towards a goal/dream/result sets forces in play that create consequences. In my leadership programs I share an idea that has helped our clients like Microsoft, FedEx and Nike: “small daily improvements over time lead to stunning results.” Also remember that most of the things we fear never happen. So why let these hallucinations called fears keep us small in our lives. You can learn more about Robin Sharma by visiting robinsharma.com, one of the most popular leadership and personal success destinations on the Internet. You may also like to download Robin’s free audio program, “Extraordinary Leadership: 5 Best Practices to Lead the Field“. Pingback: Călugărul Care Și-a Vândut Ferrari-ul de Robin Sharma | Suflet in lumina!